Integrity – doing what you say you will do – every time. Dependability – ability to be relied upon and trusted. Trust – having confidence in another’s character, expertise, abilities, and integrity. Today we will be focusing on the 4th core value: Quality. What does quality work look like at Interstates? Good drawings, detailed project plans, superior craftsmanship, great startups? Yes, and much more. 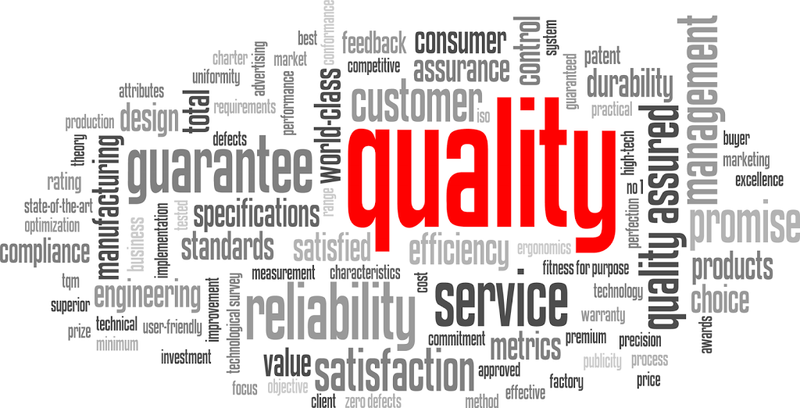 What do you think of when you hear quality? Maybe some of the words listed in the word picture above? Interstates defines quality as “providing lasting value in the eyes of our clients.” The client sets the standard for quality! It’s our job to understand the needs of the client and provide results that meet their budget, schedule and performance needs. What’s more, we need to do all this in a way that provides a positive and memorable experience for the client. Product quality is tailoring what we do to meet the client’s goals. As professionals and craftsmen, it’s important to remember our clients usually care little about our drawing details or the craftsmanship of our electrical gear installation. What they do expect is that their interaction with us will result in a plant that operates per their project and business goals. For us, this means that at times a “napkin sketch” and a functioning MCC on-time is higher quality to our client than waiting for a well-ordered 1-line and a picturesque electric room. Remember, quality to the customer is staying in budget, being on-time, understanding and meeting his needs. There are two equally busy auto repair shops. The Jones family is anticipating leaving on their summer vacation next Thursday when an unfortunate thing happens… the transmission on their Tahoe breaks down. It’s a week until they head out on vacation. In a panic, Mr. Jones calls mechanic #1 and asks if he can get his Tahoe in for repair because they are heading on vacation. The mechanic says he’s sorry, but he is swamped and can’t take on one more thing. So, Mr. Jones contacts mechanic #2. This mechanic indicates he’d love to do the job even though he feels just as busy. He asks Mr. Jones when he needs the repair done by. Mr. Jones says next Wed – the day before his vacation. The mechanic says it won’t be a problem, while he can’t fix it today, he can get it done before Wednesday. Mechanic #1 missed out on serving Mr. Jones simply because he didn’t t ask the customer when he needed the work completed. Either service shop could have fit the Tahoe in for repair, but only one shop went beyond today to figure out the customer’s time frame and need. Leading with quality does require effort, discipline, planning, and commitment. It is never an accident; it’s never simply the result of quality people; it is always the result of intelligent effort. It’s an opportunity to lead the Interstates way. I challenge you to be intentional as you work with our clients going forward. Understand from their point of view what a quality deliverable is and provide that high-level of lasting value to them.